He came in from Tatitlek, Alaska. 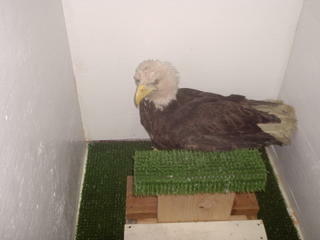 He was found at the town dump and sent to us by a local citizen, Ted Palmer. After being examined by Cindy Palmitier, it was found that he has a swollen left wrist with limited motion and was very dehydrated. He's scheduled for x-rays tomorrow to find out what the hidden issue is. He was very shy of me when I visited the clinic today. He hid behind his perch and wouldn't let me get a good picture. He's been on the ground for a bit. He's very dirty and his tail feathers are a little messed up. I'll check in on him tomorrow and we'll see what the x-rays show.